Family Soup provides support services to families with young children with disabilities. The process it takes to access services for your child can prove to be difficult for most families. Family Soup can help you to bridge the communication gap by providing valuable resource and referral information, counseling, specialized training, workshops, support groups and referral services. Families are better equipped to navigate the special needs programs and support systems. Additionally, Family Soup provides sandtray therapy sessions for children 3-5 years old with special needs or disabilities. Call 530-751-1925 for more information. 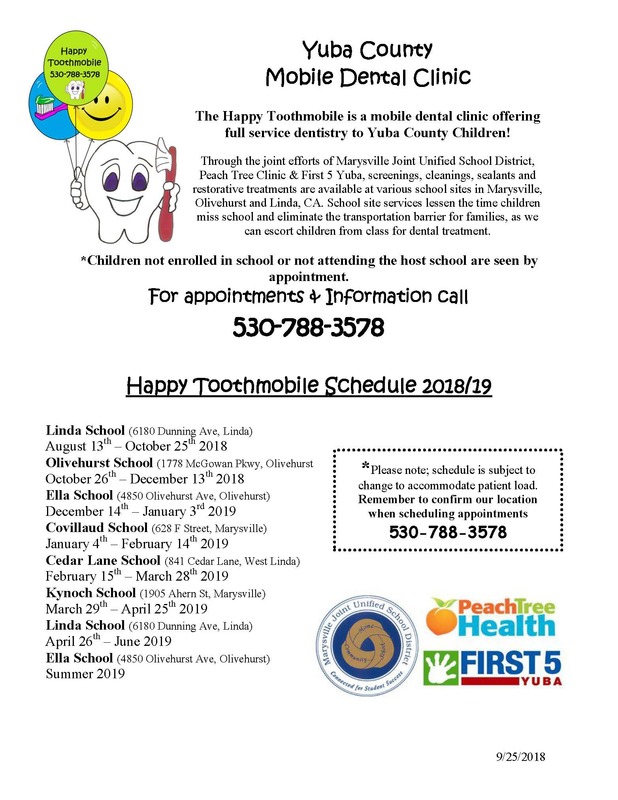 The Happy Tooth Mobile Clinic serves the dental needs of children in the Marysville Unified School District. Full Service dentistry including: exams, x-rays, oral health assessments, cleanings, sealants, fillings, extractions, varnish, pulpotomies, crowns and carries assessment. Call 530-788-3578 for more information or click here to view the 2018/19 schedule. ​Help Me Grow is a national framework that establishes a universal early surveillance, screening and detection system for all young children in Yuba County. The four major components are a centralized telephone access point, health care provider outreach, community outreach and data collection. Anyone can call Help Me Grow: parents, grandparents, child care providers, and community service organizations. A Help Me Grow Care Coordinator can answer questions and assist with accessing valuable community resources that help with the growth and development of young children. The coordinator will work with the caller to identify a child’s needs and refer them to a local agency. Services are tailored to each family and may include enrollment into a developmental screening program, coordination of community agency referrals, family navigation and more. For more information call 1-800-794-4067 or visit helpmegrowyubacounty.com.